I purchased this item and the 2-cup size going by the great pictures by 'eliner'. These cups are more suited for metric measurements. My conversion table shows 1 cup = 237 ml...well the Norpro cups have 1 cup = 250 ml. That is why several people have mentioned how inaccurate the cups are. If you use the metric system, then these cups are for you. I own the iSi 1-cup silicone measuring cup also. I compared the Norpro & iSi 1-cup side by side and recommend the iSi brand. Another thing that I like about the iSi brand is that it also has 1/3 & 2/3 markings on the cup which the Norpro does not. The iSi is more round in shape while the Norpro is more a flattened round. Being silicone, it accepts a wide temperature range. The label rates it for use from -40 to +450 Fahrenheit. So, if you bump it against something hot, it probably isn't going to melt. It is moderately flexible so that you can easily squeeze it to pour into a small opening or the like. Yet it is ridged enough to reliably hold most things. 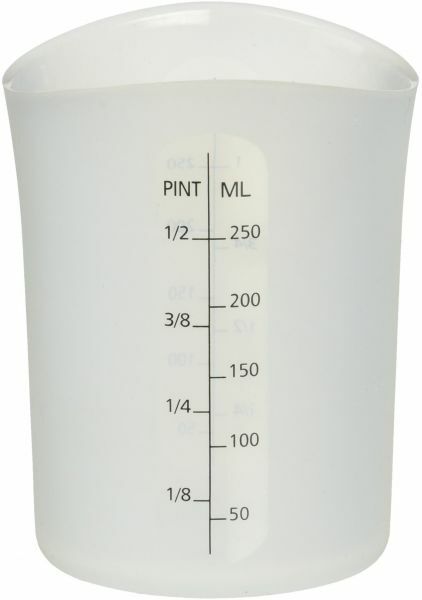 It has markings for measuring milliliters, fractions of a pint, and fractions of a cup but is lacking markings for measuring ounces. One detail that isn't obvious from the picture is that it is oblong, not round, if you look down at it from above. Silicone cups tend to be somewhat more expensive then those made of many cheaper materials, However, this one is less than many. I purchased both the 1-cup and 2-cup size going by the great pictures by 'eliner' listed under . These cups are more suited for metric measurements. My conversion table shows 1 cup = 237 ml...well the Norpro cups have 1 cup = 250 ml. That is why several people have mentioned how inaccurate the cups are. If you use the metric system, then these cups are for you. says it's good up to 230c but it smells pretty bad with boiling water. doesn't melt or anything and otherwise seems to work fine. hopefully the smell will go away eventually. works fine with cold liquids. I just love these. Easy to measure and pour. Glass ones are too heavy. Hard plastic ones etch and lose their numbers. The only negative, if any, is hot liquids might need pot holder to handle—but I still prefer no handles, easier to store together.